On July 5th, I went to a workshop with the incredibly lovely and talented Aran of Cannelle et Vanille. Have you seen this woman’s photos? I mean, come on. She is in a league unto herself (along with Helène of course). The workshop was less about photography and more about food styling. While Aran is a terrific food photographer, her real passion lies in how the food looks in the photo. She has an amazing eye and a clear picture in her mind of how she wants things arranged just so. She has amassed a collection of linens, plates, silver and other props to make her already beautiful food look spectacular. I learned a lot from our few hours together. Here were the two big takeaways for me specifically. I am not, nor will I ever be, a food stylist. I make food that I want to eat and then take pictures of it, usually moments before I eat it. Yes there are things I could do to make it look better, but usually I have impatient dinner guests who are waiting to dig in while I get my shot. Even if that was not the case, I don’t have the artistic eye that some of those incredibly talented people do. And (big takeaway #2) I really need to learn how to use my camera. Aran made some reference to her old photos and how she (shudder) had her camera on auto-everything. I have my camera on auto-everything. I know the terms aperture, shutter speed, and depth of field, but I don’t exactly know what they mean. Someone in the workshop suggested a book for me and I ordered it as soon as I got home. Aran gave us some general pointers and then demonstrated them with example after example of her gorgeous photos. One of her “rules” that stood out is to make the food look organic. “Like it just fell there.” I believe those were the exact words and I know there were quotation marks around them. I’m pretty sure the above photo was not what she meant. Yes, this cake did more or less just fall there. I turned it out of its pan onto my lovely white square platter and it did a bit of a skid. Then it decided it was too fragile to be moved into the center of the platter without shattering into a million cake pieces. So there it stayed. So let’s talk about this cake. If I say “flourless chocolate cake”, do you think one of those gooey centered things that are just about everywhere on restaurant menus? When those things are good, they are pretty awesome. Not so good and not so much. This cake is actually not much like that at all. It is indeed flourless but there is nothing gooey about it. It’s just light but not too airy and tastes purely of chocolate. While I like my chocolate a bit denser, I really liked this as an option – especially after a particularly heavy meal. Lebovitz says this tastes best the day it is made but I froze half of it, thawed it wrapped at room temperature, and it suffered no loss of texture or taste. In the original recipe, Lebovitz says to decorate the cake by sifting powdered sugar over it and then drizzling melted chocolate over that. Yum. But I knew I was going to try the freezing thing and powdered sugar starts to melt into cakes and look slimy after an hour or so. Trust me. So I skipped that step. Preheat the oven to 350ºF. 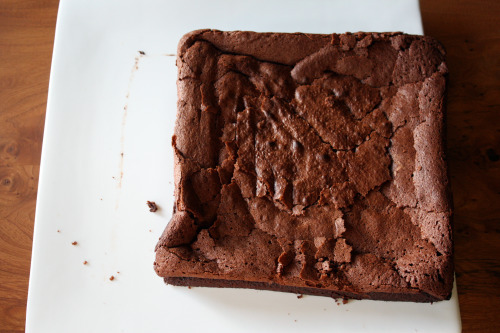 Butter the bottom and sides of a 9-inch square cake pan, dust it with a bit of cocoa powder, then tap out any excess. Line the bottom of the pan with parchment paper. In a large heatproof bowl, combine the butter and both chocolates. Set the bowl over a pan of simmering water, stirring occasionally until the mixture is melted and smooth. Remove the bowl from the heat. In a stand mixer fitted with the whip attachment, whisk together the egg yolks and ½ cup of granulated sugar on high speed until the mixture leaves a defined ribbon on the surface when you lift the beater, about 5 minutes. Fold in the melted chocolate mixture until fully incorporated. In a clean, dry bowl and with a clean whip attachment, whisk the egg whites and salt on low speed until they form soft, wet peaks. Gradually beat in the remaining ½ cup granulated sugar and continue whisking at high speed until the whites hold stiff peaks. Fold the egg whites into the chocolate mixture just until there are no visible streaks of egg whites. Don’t overfold. Scrape the batter into the prepared pan and gently smooth the top. Bake until just barely set in the center (it should still feel jiggly), about 35 minutes. The cake will rise as it bakes and form a slightly crackly top. Let cool about 15 minutes. 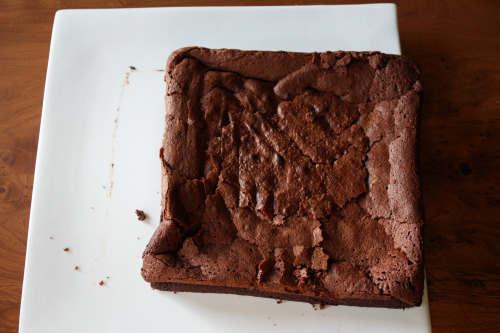 Run a knife around the sides of the cake to help loosen it from the pan. Invert the cake onto a plate, peel off the parchment paper, and re-invert it onto a large platter or cutting board. Let cool completely. Lucky you! Sounds like a fun day and that cake is calling my name right now! If you’re interested (and I won’t be offended if you’re not!) I do tutor folks with one-on-one private photography lessons. Otherwise, your photos are not bad at all! I do like how that cake just plopped there with some crumbs off to the side. You could probably take a piece out of it, or add a generic tea towel, to add visual interest. Or have it directly on the wood. Honestly, it’s not bad! thud! I love this. And I love that you stayed true to yourself! Your recipes are always approachable!! I wonder what we are gonna take away from our food conference next month? I love that you left the cake where it landed! So great! So much of this post rings true for my approach to my camera and to food photography. I love your honesty! Never stop learning, but always stay true to yourself. I love the photos on that blog too, truly works of art. I still use my old digital point and shoot camera, and live in fear of upgrading (typical me). That cake looks mighty nice. Such an awesome opportunity to meet them and learn from them, though! If this cake is a Lebovitz recipe that you KNOW it has to be good! Don’t worry, your chocolate cake looks absolutely charming! What’s the title of the book you ordered? I’m thinking about getting a dslr but I’m pretty clueless when it comes to photography! you served this with the caramel ice cream? oh girl, hello! Sounds like a great class! Aran’s photography is so inspiring. But then, you inspire me with your cooking… so there you go! I feel the same way about food photography! I certainly appreciate well done photos, but I can’t really do it myself and I’m okay with that. I love your thudded and skidded cake. It looks lovely and delicious and I’d love a bite right now with some ice cream. Mmmm. Aran is an amazing food stylist and her pictures always makes me want to start cooking/baking right away (no matter if I had the biggest dinner in my life, five minutes before). But your vegetarian cooking and your writing has the exact same affect on me. Now your chocolate cake is occupying my mind. And there it will stay, until I actually make it. Dana, it was great to meet you during the workshop. The cake looks great. Sometimes an organic approach like this is all that is needed. A cake that fell right there is just as perfect. We all have different styles and that’s the beauty of it all. Now, if I could taste it, I’d be one happy camper! I love that people think I make a separate meal just to photograph it…not!! That’s our food, that’s what we eat, generally right after it’s photographed. I start thinking about a frame as my dessert or meal is baking/cooking so a set up does not take me hours and hours but more like 10-15 minutes and once you get comfortable with the technicalities of your camera, that’s even less to worry about. That’s where Jackie can really help you – once you grasp focus points, focus length, etc…and if you feel you need help with that, you will have more time to set up/shoot and eat – all within minutes not days. It’d make my husband mad as hell if we had to wait hours. Your photography is yours – no one can take away from you. And it’s beautiful. Too many times I see people emulating one another that I feel like I am reading the same and only blog from 2 or 3 I have opened in my browser. I think these are valid thoughts and you have done significant soul searching to come up with what your limits are, what your interests are, and how much of your time and resources you’re willing to invest to reach them. There is a lot of copying out there, in good faith and in not so good faith– just look at flickr dates on images to see. And as an editor of a food column, I do believe that most of the food blogs out there look alike: they all rely on shallow depth of field, they all use the same backgrounds (distressed white wood, distressed blue wood, distressed gray), they are all almost always overexposed and painfully so, they use ribbons and string, polka dots, and it’s all almost always the same food: cupcakes, little cakes, tarts, fruit, eggs with chicken feathers… This is in part because people emulate, in part because people lack creativity, in part because people are trendy/feeding trends, in part because people learn these techniques in workshops and instead of applying the knowledge to develop their own styles, they just emulate. I think it’s hard to be inundated with images and not repeat things you’ve seen even inadvertently. Also I think that studying as many images as possible of –GOOD– work and copying while you’re trying to learn can be useful. At the end of the day, I think if you’re interested in images with better styled food you might work with someone who does it well. Same with styling. Often that helps the learning process. Otherwise, knowing and accepting your work and not comparing yourself to others who may have more experience, technical skills, time, and money is also quite liberating and makes doing your hobby fun and not competitive or cutthroat!